Words by Kevin Doocey on July 11, 2012 . There has been some typically bad journalism from the Daily Mail in the last few years regarding Newcastle United, but they’ve certainly topped this years efforts with the latest rumour. Today, they linked Yohan Cabaye to Barcelona - for a fee of £8m. First off, why would Barcelona need more midfielders with the likes of Xavi, Iniesta, Busquets and countless others in their ranks, including all their young prospects that will gradually make a move up to the first team. Secondly, Cabaye for £8m?! Without doubt France’s best player at EURO 2012, and did a decent job against Spain as well as being inches away from scoring a remarkable free-kick. Some of these stories are absolutely laughable. Another instance of how little effort the Daily Mail put into their research would be our recent linking with a certain North Korean striker: Jong Il-Gwan. The Jong Il-Gwan stories linking him to Newcastle United were total fiction as later admitted by a bunch of forum regulars as they wanted to prove a point about how some papers will go with any lead at all. Needless to say; the Daily Mail and their ‘insider’ Simon Jones claimed NUFC were indeed interested in the Korean and rated his chances of arriving at St.James’ Park 3/5. It just goes to show you how much you can trust these tabloids. The only paper and online publication I’d trust is the Guardian, as they are nearly always spot on in their reports, and their articles usually go beyond 150 words unlike the ‘paper’ above.. Anyway, with that said, Yohan Cabaye and Barcelona is a no-go. 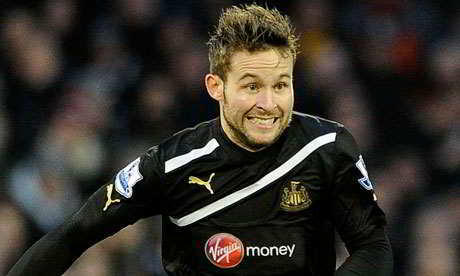 Cabaye doesn’t want to leave, Barcelona don’t need him, and £8m wouldn’t pay for right arm. The story is going no where, and neither is Yohan. Certainly not to Barcelona anyway. £8m for one of the best midfielders in the Premier League last season - I’ve heard it all. Fact is, the London press are absolutely livid Newcastle haven't crashed and burned, and are desperate our success stories don't stay at Newcastle. Just the other day on Talk Sh*t radio, a typical woman reporter she was as bad as you'd imagine, but still nowhere near as bad as the BBC "wimmin" TV and Radio "sport" reporters who know less about football than I know about Nuclear Physics - well, this "Georgie" or whatever had been doing a show called Transfer tavern or whatever and had on the subject of Newcastle said she was "astounded" Cisse, Cabaye and Tiote were still at Newcastle. The Londonj mentality is worse now than at any time in history. Arrogance off the graph. And this stupid cow was a prime example. But they are genuinely furious Newcastle have great players who are only going to get better. They HAVE to sabotage - it's an intolerable position - what happens if Newcastle actually WIN something ? They have to sabotage !